CCMS teacher Greg Smith shares his classroom management talent with teacher observers. Last Monday I had the pleasure of dropping in on instructional walks that were taking place at Cañon City Middle School. Principal Tim Renn periodically takes teachers around to observe experts exhibiting high quality instructional strategies each might incorporate when they return to their classrooms. Last week’s focus was classroom management, and this provided the opportunity to observe Greg Smith’s 6th grade science instruction. Mr. Smith, despite occupying a classroom poorly equipped for science, provides clear learning targets for his students and highly engages each of them in mastering curriculum concepts. I want to thank Mr. Renn for continuing this practice that allows teachers to learn from each other, and Mr. Smith for letting us to intrude to see for ourselves how classroom management can be done well. On the topic of visiting classrooms, I want to make sure our instructional leaders (principals, assistant principals, TOSAs, and coaches) know I have noticed the effort they are putting in to observing classroom instruction to provide constructive feedback that supports teachers to improve their craft. If you could be a fly on my email inbox wall you would be amazed at the quantity of this work being accomplished on a weekly basis. One of the hardest things for an instructional leader to do is to set aside the time to be in classrooms to observe and support teacher instruction. It is my opinion that when done well, there is nothing more impactful a leader can be doing to support increased student achievement. On a final note this week, I want to thank the administrative and operations staff of Cañon City Middle School for the expert way they responded to a seriuous emergency last Thursday. In the middle of the day a fire alarm tripped and it was discovered that a boiler caught fire. When the alarm sounded nobody knew the emergency was real. However, staff and students properly evacuated the school as a precautionary measure, as should be the case when a risk is unknown, and operations staff quickly located the danger and doused the flames using a fire extinguisher. The Cañon City Fire Department was dispatched to the scene and, after declaring the building safe, students and teachers got back in the building and learning continued for the rest of the day. 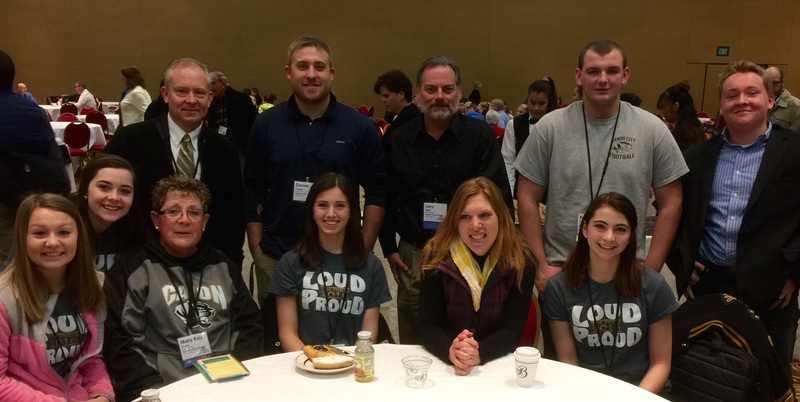 2015 CASB student leadership strand participants posed with board members last December. This week our board of education will attend the Colorado Association of School Board’s annual convention in Colorado Springs. This allows Colorado’s school board directors an opportunity to network, learn about key education issues, and to hone their craft as school district leaders. For the second straight year Cañon City Schools will also be bringing along high schoolers to attend the student leadership strand. Last year’s cadre of student leaders were asked to consider what public education should look like by the time their kids attend school. I think engaging our students in this work actually provided our board with an incentive to take a closer look at the future of Cañon City High School, leading to the establishment of a new school vision and mission, and officially embarking on a career pathways model. I look forward to meeting this year’s student leaders this week and to learning from them what we might do to provide them with higher quality, relevant, educational opportunities. Speaking of the future, last week CCSD began creating a vision for the future use of technology in the education of its children. A committee, consisting of Karin Steadman, Shad Johnson, Kristyn Econome, Jessica Stevens, Heather McLaughlin, Mark Lyons, Daniel Coppa, Lisa Bryan, Scott Witkowsky, Julie Campbell, Melanie Smith, Alex Hill, Adam Hartman, Bill Summers, Tanna Miles, Hillary Leeman, Hunter Dean-Moore, Shaun Kohl, and myself began by establishing an agreed upon purpose. This is to develop a 5-year technology strategic plan that will make it possible for CCSD students and teachers to access and utilize cutting edge technology tools in the process of learning and creating. We feel we need to do this because, though many of our students have access to a variety of technology tools at school and at home, we feel our limited access to the internet on campus, the age of our devices, the preparation of our teachers, and the lack of opportunity for all students are causing a significant portion of them to never receive the opportunity to explore and apply how technology might benefit their lives and lead to well-paying careers. During the meeting we addressed matters such as where we already do a great job providing students opportunities to learn while using technology, discussed to what extent our students have access to technology when they are not in school, and if so, what they actually do with it. We also discussed to what extent our teaching staff has access to advanced technology tools, and determined we should conduct student, staff, and community surveys to better answer these questions. This committee will meet again in mid-December to finalize survey language and deliberate the value of a potential one-to-one device initiative. We will meet periodically and finalize our work by mid-spring so we can put in place our plans for improvement. Carned the Magnificent (also known as Trinidad Schools superintendent Scott Mader) made an unexpected appearance at the Southern Superintendents Association meeting last Wednesday. His trusty sidekick was CASB's one and only Mark DeVoti. I spent Monday after Thanksgiving break catching up on office paperwork and general communication items. I also met with director of special services Lynnette Steinhoff about parent special education concerns, and attended a district literacy team PLC. Tuesday began with my weekly Superintendent’s Advisory Council meeting. I also met with director of finance Buddy Lambrecht about a process by which we might better analyze our district fund expenditures, and align them to common practice. I then attended a follow-up meeting with the Office of Civil Rights about a special education program review, and then I attended a district Technology Visioning committee meeting. On Wednesday I travelled to and from Pueblo for a Southern Superintendent Association meeting, returning to the offcie in time to address some communications issues. On Thursday I had my monthly touching base meeting with RE-2 superintendent Rhonda Roberts. At this session we discussed how we might better collaborate on health and wellness, nutrition services, and school safety matters. I then had a construction costing out session with operations manager Jeff Peterson, mechanical and structural engineers. construction representatives, and architects. I ended the day Thursday in a meeting with parents. Our district literacy team works with a Lindamood-Bell trainer during one of their monthly PLC sessions. I’ll begin the day Monday in a team budget session related to the progress of our Early Literacy Grant. I’ll then spend time finalizing my weekly communication to the staff and community before pedaling over to Cañon City High School to meet with Mr. Daniel Coppa and the young men and women who have been selected to attend the Colorado Association of School Boards student leadership strand. I'll meet with an administrative intern about construction issues, and then CCHS principal Bill Summers about future plans for his instrucitonal program. I’ll spend the later part of Monday attending to office work. On Tuesday I’ll begin my day at 6:30 AM at a Cañon City High School building leadership team meeting. Then I'll appear on Morning Line at KRLN radio before returning to the administration building for my weekly SAC meeting. Mid-day I'll trek to the quarterly PCC Fremont Campus advisory committee meeting before returning to my office for a series of meetings. On Wednesday I’ll start my day with a monthly administrative team meeting, my monthly touching base meeting with director of special services Lynnette Steinhoff, a monthly discussion session with our operations staff at the district warehouse, and then I will take Anna Fitzer, a representative of the Colorado Department of Education’s Building Excellent Schools Today program, on a tour of the facilities we would like to address through a BEST grant we intend to apply for. I’ll begin my day Thursday in Colorado Springs at the pre-session of the Colorado Association of School Boards annual convention, but return to Cañon to participate in our annual classified staff Christmas party and years of service recognition ceremony. I’ll then spend Friday, Saturday, and Sunday in Springs attending the remainder of the convention.